Never To Late is an appropriate name for an album when it’s been 30 years between recordings. In 1986, Stephen Leech and Stephen’s Ruin released a well received EP before hanging the guitar up and running a pub for 30 years. Stephen’s Ruin is back and with an album worth of pretty catchy melodies. There’s a garage rock sensibility that runs throughout Never Too Late, making for a really fun record. The vocals work well for most but not all. But one thing is consistent. Leech, Stefan Theissen (the band’s bassist) and drummer Matej Havranek can all write an effective hook (or three). The quick tempo, sing along chorus and infectious melody make “Jeanine” the standout track. “September’s Favourite Child” is first rate guitar pop. Fans of the classic garage rock sound will dig “The Only One”. If there’s one common thread throughout, it’s the engaging melodies. This record is chock full of ‘em. 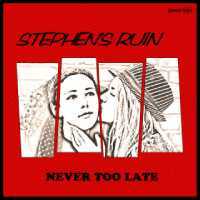 Get your copy of Stephen’s Ruin’s Never Too Late from Kool Kat Musik.